George R.R. 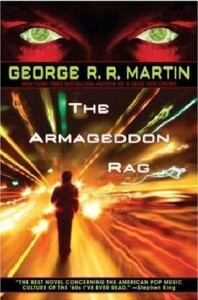 Martin is most associated with the Science Fiction/Fantasy genre, and for a long time the only novel of his that remained out of print (it has recently been reissued) - “Armageddon Rag”, is a rare example of a novel by him that doesn't really belong in either genre (although arguably there are a few fantasy elements to the story). The main character is Sandy Blair, a former music journalist and survivor of the rock scene of the late 1960’s. He is coaxed out of his comfortable but dull career as a novelist to investigate the murder of the manager of the former stadium-filling heavy rock band “The Nazgul”. The band had split a decade before (the novel is set in the early 1980s) after their leading singer had been assassinated by a sniper in the middle of their biggest concert. As Sandy travels round attempting to interview the surviving members of the band, he begins to suspect that someone may be attempt to force the band back together to do another tour. Despite their largely unsuccessful lives the surviving band members realise that they would be a poor shadow of their former selves, but are tempted by the prospect of reforming. As he travels the country Sandy also takes the opportunity to look up his old friends from the 1960s and see how life has been treating them. In the later stages of the book some fantasy elements start to creep in (although there is nothing definitely magical happening) as Sandy starts to have premonitions that the Nazgul’s new tour will end in a bloodbath. This is an entertaining novel with some flaws. When the Nazgul’s tour starts Martin does succeed in making the concert descriptions both convincing and compelling. At times it seems a pity that the Nazgul are merely fictional because a soundtrack CD would be a great accompaniment to the book. The characterisation is variable, Sandy is a likeable protagonist but the members of the Nazgul (other than bassist and songwriter Peter Faxon) lack depth and his old friends tend to be fairly irritating archetypes. Sandy’s quest to visit his old friends isn’t nearly as interesting as the main Nazgul plotline and some of the subplots (his visit to his insufferable catchphrase-quoting friend Froggy in particular) would have been better left out. One subplot, the tragic story of his old friend Slum whose life was ruined by his father’s hatred for him refusing to fight in Vietnam, is interesting but too short and peripheral to the main plot to really have much impact on the rest of the novel. The eventual antagonist in the novel is also one of Martin's less successful villains whose motivations for their actions feel a bit unconvincing. In summary, this is an entertaining book overall, but not Martin’s best. It is however recommended for fans of classic rock music, and people who actually remember the 1960s (or were there but don't remember them) might get more out of it.